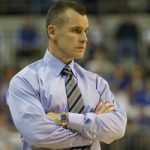 Florida Gators head basketball coach Billy Donovan met with the media on Wednesday, two days before his team opens the 2014-16 regular season against the William & Mary Tribe on Friday, Nov. 14 at the Stephen C. O’Connell Center in Gainesville, Florida. Ahead of last season, Donovan chastised the Gators, going out of his way to say that Florida was nowhere near as good as advertised. Twelve months later, his attitude has not changed all that much. Is UF the seventh-best team in the country? “No, not even remotely close,” he said Wednesday. “We’ve talked a lot about that from the perspective of… I know what those kinds of teams look like, and we’re not one of those teams,” Donovan added. Did Donovan say the same thing last year about a team that wound up advancing to the Final Four for the first time in seven seasons? You bet. Does that mean that he recognizes his standard annual pessimism? Not one bit, because every season is different and this year’s issues are different than those that the Gators had in 2013-14. “And I was right. We were totally dysfunctional,” said Donovan of his comments from a year ago. “We had our starting point guard suspended seven games. Damontre Harris was [missing in action]. You wouldn’t have felt good either. Now, we evolved into a team and hopefully we can [do that again]. But right now, that is something I would say for our guys, I think they understand that’s not where we are right now. It’s not. 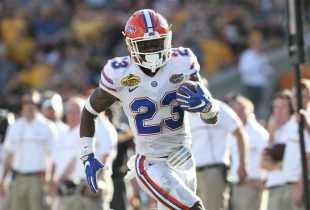 Donovan remains most concerned with Florida’s defense, noting as OnlyGators.com first reported two weeks ago that UF struggled in its secret scrimmage (and once again when facing Barry last week). “The three scrimmages that we’ve basically have played, OK, we are giving up an average of 82 points a game – and we are giving up 48 percent from the three-point line. So if that continues, it’s hard for me to say we’re the seventh-ranked team in the country,” he noted. Following the Gators’ exhibition game, Donovan harshly – and deservedly – criticized freshman forward Devin Robinson for his play. Robinson ignored some pre-game instructions that Donovan shared with him personally, which included worrying about doing the little things rather than concentrating simply on scoring. Robinson took numerous bad shots and was ineffective in other areas, leading his coach to give an honest assessment of him after the contest. One week later, he’s pleased with the way Robinson responded to his disappointment. “I tried to help him understand, when you do that, you take your focus and your mind off what your job is and what’s going on. And I felt like when Devin got in the game, it was just all about scoring. … I was disappointed with him because I had a conversation with him specifically about that,” he explained again. While Robinson has received some due criticism from Donovan, Chiozza has gotten some praise from the future Hall of Fame coach, who continued his positive assessment of the player on Wednesday. “I thought Chiozza really responded and played well, especially coming down the stretch. I thought he did a really good job for us [in the exhibition game],” he said. Donovan is also pleased with how Robinson and Chiozza have approached the game from a work ethic perspective. He thinks “they can cardiovascularly handle” playing the college game and will be “able to sustain intensity” at a high level, at least until they hit the rookie wall at some point this season. » Donovan plans to start the same five players he did in the exhibition game against Barry – freshman PG Kasey Hill, sophomore guard Michael Frazier II, redshirt junior G Eli Carter, redshirt junior F Dorian Finney-Smith and center Jon Horford. Pitino is the poster coach for the fact that it doesn’t matter that much how you look in November. It’s all about how you look come February and March. I trust that Coach D. will mold this talented group into yet another good Gator basketball team. Should be fun to watch. I’m excited. Love the touch-the-stove analogy. So true, and yet another example of why Donovan is a great coach. Oh no! This season is going to be a disaster! I have never seen Billy be so down and negative on the team early in the season before! We will be lucky to win 10 games!